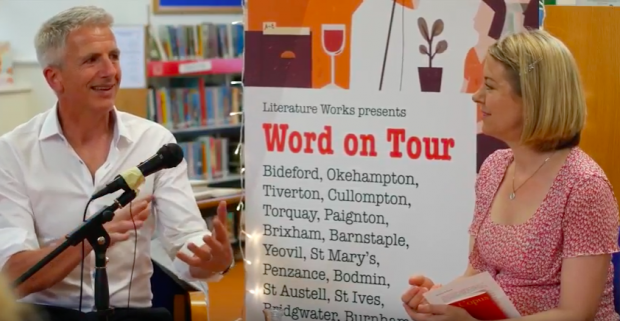 Word on Tour is a 26-venue live literature tour of libraries in south west England. It’s a partnership between SWRLS (The South Western Regional Library Service) and Literature Works, the regional literature development agency, and was funded by Arts Council England’s Strategic Touring Fund. And if the following quotes from those who took part are any indication, it was a success from any perspective - library staff, audience members, and writers. "Giving the library the feel of a real performance venue"
"Libraries are the only free, warm, welcoming space; non-judgemental, open to all and offering access to the thoughts of the world, culture, all free! The only place! The mark of a civilised society." "I took my books - words mostly on birds - to two libraries on the coastal edge of the British Isles; I could see the sea from both. The world outside is what inspires me - here the outside came in. My words in such places came alive. That is surely good." "Reading in libraries after hours I felt from the off that I was among friends, co-conspirators even." Our aim was to bring to the doorstep of local communities a literature experience that skilfully combined artistic talent, eye-catching branding and a warm, convivial atmosphere that would bring in new audiences. We tried to run events in the evening - with an interval for refreshments and mingling - that felt like a real ‘night out’. We wanted to produce accessible events at libraries in locations where there is a general lack of cultural activity. Each library was given some complimentary tickets that they could use to target local community groups, students and young people. As a result, our evaluation statistics to date – with 3 out of 26 tour dates left to go – show that 26% of our audiences had never been to a live literature, spoken word or author event before. We also set out to support local libraries in their development as community-based live literature venues within a regional network. We wanted staff to feel like confident and experienced producers of events. Achieving this goal has been dependent on building staff skills and their capacity to reach out to local audiences. One of our biggest challenges has been the lack of staff capacity at some of the library venues. The tour showcases excellence: writers who have achieved a level of success and recognition. They are all based in south west England, so it’s also acted as a networking opportunity and a way to help build a supportive community of writers. Two writers performed at each tour date and we deliberately created unexpected pairings, mixing literary novelists with performance poets, writers of creative non-fiction, and even one singer-songwriter performing the poetry of Cornish poet, Charles Causley. 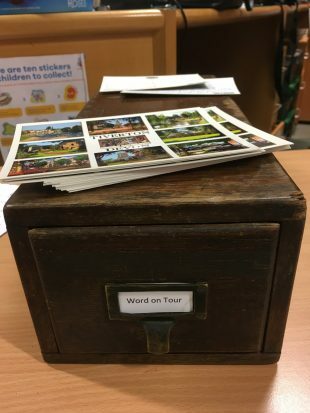 To reinforce the sense of a tour and help create a buzz, we took an old library index box on tour, containing postcards from each of the tour towns. 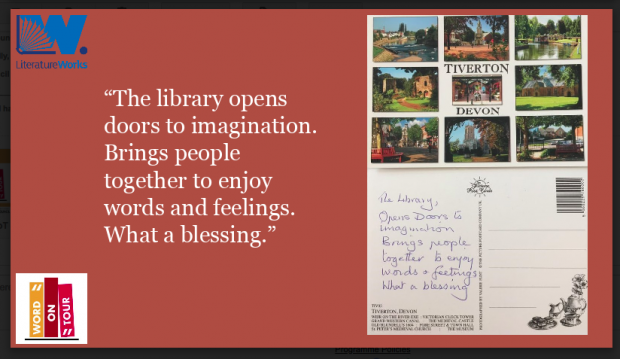 In the interval, we invited audience members to write on a postcard depicting their town about why libraries matter. This was very well received and has generated an inspiring legacy collection, all about the importance of libraries, that traces the geography of the tour and links directly to audiences in the towns and libraries it has visited. As the tour comes to an end, we are in the midst of preparing legacy resources in the form of short films (2 have been published already: showing Nether Stowey, and Petroc College), downloadable guides and FAQs that will support libraries with future live literature events of this kind. Libraries in the South West can apply to the newly re-opened Literature Works Annual Fund for small grants towards producing future live literature events and we will play an active part in advising and encouraging their efforts. Remember that 26% of our audiences for Word on Tour have never been to a live literature, or spoken word event before? When asked for three words to describe the event and how it made them feel, the most popular words people used were: interesting, entertaining and inspired.